After long lasting negotiations, MSC group, in partnership with Moby, submitted Guangzhou Shipyard International (GSI) and China Shipbuilding Trading (CSTC) – both controlled by China State Shipbuilding Corporation (CSSC) – formal orders covering the construction of 4 ferries (plus an option of further 4). The new ferries, 230 metres in length, capable to board 2,500 passengers and over 3,700 linear metres rolling cargo, will be fitted with LNG – ready systems, enabling natural liquefied gas propulsion. As anticipated, this maxi order will further strengthen the alliance between Gianluigi Aponte and Vincenzo Onorato, previously tested in operations (by cooperating in the launching of few lines) and partnership (having founded AssArmatori). The first unit (to be delivered by 2020) and the third one will be deployed in Grandi Navi Veloci’s fleet (MSC’s subsidiary), while the second and the fourth newbuildings built in China will be joining Onorato Armatori’s fleet. Furthermore, each company also boasts a buying option covering 2 further units. 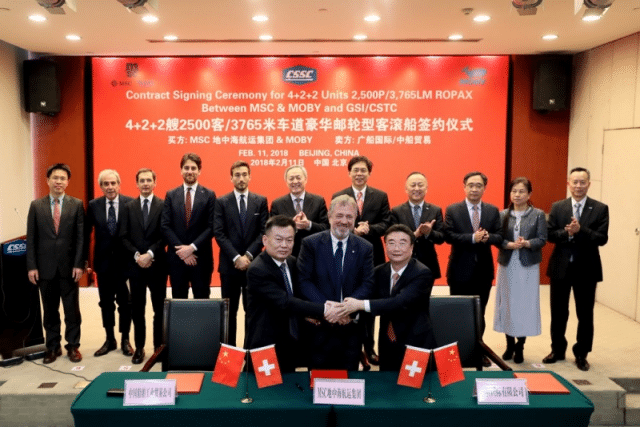 The signing ceremony, recently held at CSSC headquarters in Beijing, was attended by Dong Qiang, President of the Chinese shipbuilding group, by Pierfrancesco Vago, representing MSC, Achille Onorato, on behalf of Onorato Armatori, and GNV’s Managing Director, Matteo Catani. 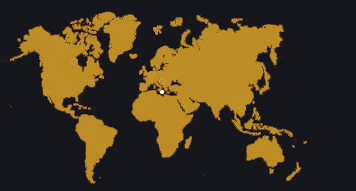 According to Vago, “these orders show our commitment in China, where we have been operating since 1998, currently holding 24 branches. In years, we manufactured in Chinese facilities overall 70 containerships and 3 million containers, actually exceeding 10 billion dollars investment. We also handle 10 million TEUs/year in partnership with renowned domestic partners and, as from next May, we are going to homeport the MSC Splendida, one of the most innovative units in MSC Crociere’s fleet, right in this country”. The manager of MSC group also added that the company is particularly pleased by the excellent development achieved by the shipbuilding industry in the Popular Republic of China, “reason why we determined turning to Chinese partners to enhance our ferry business”. Achille Onorato, proudly continued: “The recently ordered units will be the largest ro-pax ever built and their technology and comfort will become a landmark for this sector. The Onorato family has always bet on innovation and these new ships definitely show our commitment in providing continuously upgraded passengers and freight services in the Mediterranean”.